Kevin and Lexah are so dear to my heart. I had the privilege of documenting their first sweet growing baby, growing inside mama Lexah. We scheduled their maternity session for a February Friday, but in looking at the calendar we noticed it was raining ALL WEEK. So we quickly adjusted schedules and babysitting and moved it to the only sunny day of the week. 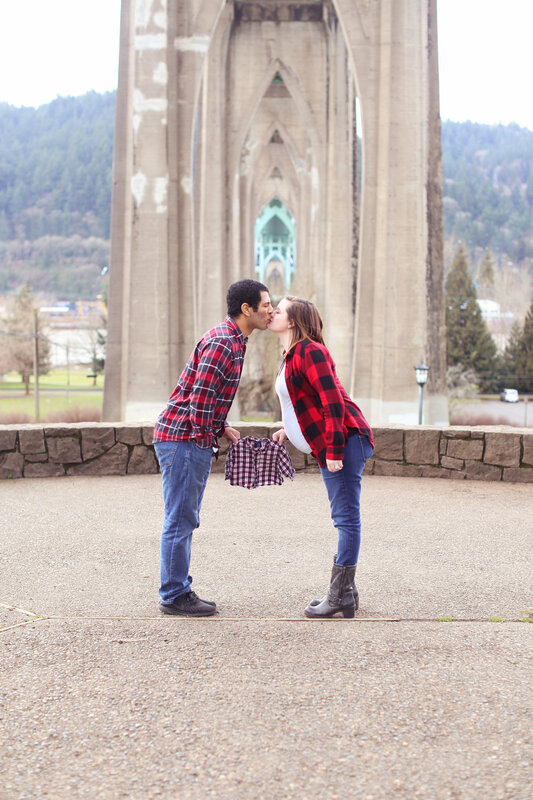 We met at the beautiful Cathedral Park of Portland. It had been raining so much, so the bank of the river was much smaller than it was the last time I was there! We made due and stuck our toes in the sand and enjoyed the varying views of the park. I love documenting couples and expectant parents. Rounding bodies, growing humans, is such a miracle and gift that it makes my heart just swoon to capture these precious moments! Lexah and Kevin adore one another and their little one. We can't wait to meet you, Anthony! Want to connect with Lexah? She shares her journey of becoming a mama and life with an autoimmune disease over on her space at This Mama's Journey.